I am pleased to Welcome all of you to Mary Star of the Sea High School. 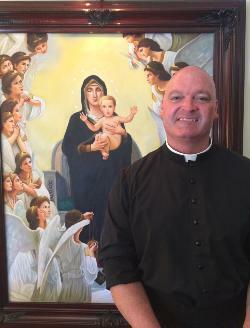 I am Father Harrigan, the new pastor of this fine parish and her legion of schools and services to the Mary Star community. Under the heavenly patronage of Mary, Star of the Sea, and the leaders who have served this parish before me, I hope to build on the legacy they have left us. Educating the “whole student” through faith, academics and service is our primary mission under the guidance of our rector, Fr. Nicholas Tacito, O.Praem, and our principal, Ms. Rita Dever. I look forward to working with them and the parents and students of this school. Students sail through high school on three important ships: scholarship, discipleship and friendship. We challenge our students to grow their minds and pursue knowledge, wisdom and truth to aid their future successes by providing a solid core curriculum. We ask them to live their faith and nourish their souls through goodness and charity by advancing a strong Catholic identity. We want them to build strong bonds with their classmates and community by respecting themselves and others. We are able to offer a fine education to so many young men and women because of the hard work, dedication and generosity of so many of you – faculty, parents, students, and alumni. With your continued prayers and support, and under the outstretched arms of our Blessed Mother, I look ahead to a shining future in which Mary Star of the Sea High School continues to serve many future generations. Please visit Mary Star of the Sea Parish website by clicking here.